Did you know that the Fifth Avenue Hotel at Madison Square in New York City, completed in 1859, was a marvel of its time? 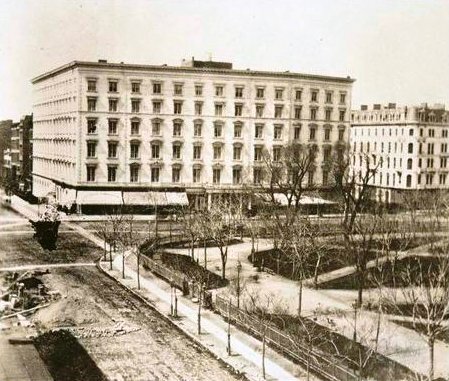 The hotel boasted private baths for eight hundred guests, a fireplace in every bedroom, and a staff of four hundred. It quickly surpassed the once-opulent Astor House as THE hotel in New York City’s social scene. It also had the city’s first steam-powered elevator — “the vertical railroad” — which could carry guests and luggage up to the top (6th) floor. The elevator introduced a change in guest preference to rooms on the upper floors, which were located further away from the noise and smells of the street. From politicians to entertainers, European royalty to American royalty (the ultra-wealthy), the grand hotels of the Gilded Age played host to the famous of the day. They were sumptuous worlds of luxury and mechanical ingenuity, built on a scale undreamed of just decades earlier.